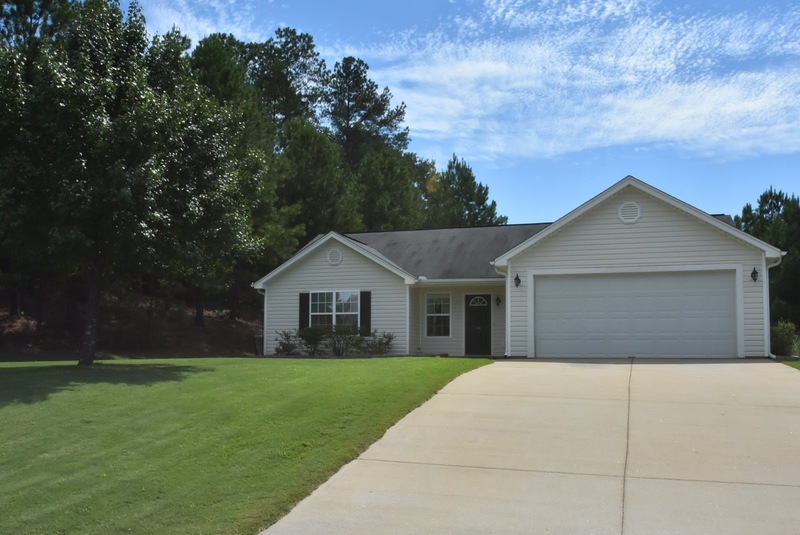 Pride of ownership shines in and out of this like new ranch style home! In a cul-de-sac location, it sits on a 0.68 acre lot, the largest lot in the neighborhood. A sprawling and manicured front yard reaches the middle of the cul-de-sac. There are blueberry bushes, a peach tree and an apple tree out front. Inside a wonderful open floor plan greets you with vaulted ceilings and gas logs in the great room. The breakfast room, bathed in sunlight, off the great room is tied into the kitchen with an eat-at bar. The open floor plan continues into the kitchen. Featuring wooden cabinets, a built-in microwave, dishwasher, disposal, the fridge stays, and great counter space offers room to work! Off the kitchen is a walk-in laundry room complete with cabinets and beyond that is the two-car garage. Also off the kitchen is a large master suite. No shortage of closet space here with a 6 x 5-foot walk-in closet off the vanity area. The vanity is open to the rest of the master suite and is approximately 23 feet from the opposite bedroom wall. A separate room off the vanity holds the commode and the shower/jetted tub combo. Moving to the other side of the house there are two bedrooms, a full bathroom and linen closet. In the foyer is a large 4 x 7-foot closet which stores the hose for the central vacuum. Opposite of that storage closet, off the great room is an office that could easily be a playroom, media room or maybe even an art studio! New flooring and paint go throughout this wonderful home. A back patio overlooks the level and shaded yard. A great space for barbecues and lounging around the fire pit. Tall pines are prevalent along the side of the house. The edge of the back yard and edge of the side yard both slope up for added privacy. A stone lined flower bed and growing shade tree in the front yard add curb appeal to this already well tended home. Convenient to both Spartanburg and Greenville, within Spartanburg District 5 schools, and less than five minutes to Wade Hampton. Call for a private viewing today!